More than 150 wood pellet manufacturing mills operate across the U.S., many supplying the domestic woodstove pellet market with home heating fuel. More than a quarter are industrial pellet mills, grinding thousands of acres of forest into biomass for overseas export to electrical utilities stoking retrofitted coal-fire furnaces with "densified" wood. The largest mills, concentrated in the southeastern U.S., claim to sustainably harvest timber, from both hardwood and softwood forests. 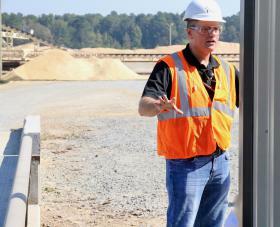 But a new mill, Highland Pellets in Pine Bluff, which harvests only fast-growing Southern softwood pine may be among the greenest. Still, the calculated ecological costs and benefits of forest biomass remain hazy. Highland Pellets, Arkansas’s first wood biomass factory, steams and rumbles in the autumn sunlight. 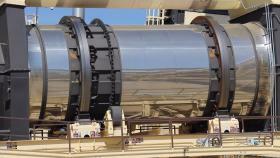 A private railroad encircles the new 209-acre facility, packed with tilting aerial conveyors and curving metal chutes. Every 10 minutes a logging truck rolls into the plant, hauling a 28-ton load of tree trunks harvested from Southern pine stands within an 80-mile radius. At full capacity, the new mill will process more than a half-million metric tons of wood pellets a year. Bobby Taylor, vice president of Shelby Taylor Trucking based in Sheridan, is a third-generation commercial Southern pine logger who supplies the mill. “People grow corn? I grow pine trees,” Taylor says, grinning. Southern pines, mostly loblolly with some shortleaf, are planted in rows like agricultural crops and grow fast, he says. Within a dozen years, the pine trees can reach 50 feet with a girth of eight inches. Taylor calls this pulpwood. He's among several private foresters contracted to supply the mill with 250,000 tons of pulpwood annually. Tablets and smartphones, however, have drastically reduced the demand for paper, and the lumber market has yet to recover from the Great Recession housing construction crash, which is why Arkansas foresters, Taylor says, are super excited about this new wood pellet biomass industry. A giant crane grabs bunches of the tree trunks and drops them into a long, horizontal metal tumbler that debarks them. Flailed white logs emerge onto a chain conveyor which drags the timber into an enormous chipper. Golden wood chips pulse out of the chipper onto a long, mobile aerial conveyor which deposits the chips into huge fragrant mountains. The mill also stockpiles mountains of wood bark mulch, hauled in from local sawmills. A mechanical lever raises the entire semi-tractor trailer truck 40 feet high in the air — backwards — to dump the waste bark out onto a conveyor. The bark is burned to heat thermal oil, piped through a long metal oven through which wood chips are dried before being hammered into rough sawdust. Fire is of great concern here. A plant surveillance team comprised of four technicians works 12-hour shifts eyeing live video monitors and telemetry screens, checking mill feed rates as well as for any threatening sparks. The plant uses a state-of-the-art fire detection and suppression system to instantly douse smoke and flame. Technician Nick Geiger points to a screen showing the interior of the plant's oven, filled with curling wood chips. He moved here from Alaska where he worked in the domestic wood pellet industry. 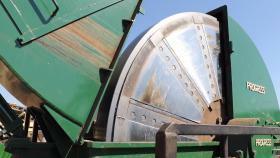 Other teams of technicians operate 20 wood extrusion mills on site, which densifies — an industry term — the dried, crushed wood chips into pellets. Doak grabs a handful from a chute. The shiny cream-colored bits look like a fiber breakfast cereal. One 10,000 metric ton mountain of wood chips takes around 3 days to process into pellets which are stored in tall steel silos on site. The pellets are loaded into railroad box cars, shipped 400 miles south to the Greater Port of Baton Rouge where Drax Group, a British electrical utility, takes possession. They are offloaded into ocean cargo vessels bound for the U.K. to fuel Drax's retrofitted coal-fire generating stations. The United Kingdom and European Union, on schedule to generate 20 percent of electricity from renewable resources by 2020 to reduce greenhouse gas emissions, require a motherlode of biomass to meet that goal. U.S. industrial pellet producers claim their densified forest biomass will reduce coal’s lifetime carbon footprint by about 80%. Ninety percent of U.S. forests are privately and publicly owned, considered merchantable timber land. The rest is legally reserved forest, out of reach as biomass. Many federally-owned public forests, especially in the Southeast, are managed, some logged for pulpwood and construction lumber with proceeds going to the federal government. They could be a significant future source of pellets. 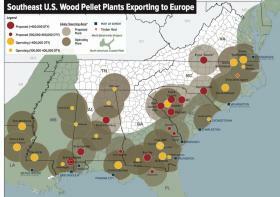 The largest industrial pellet mills concentrated in Louisiana, Alabama, Mississippi, Florida, Georgia, and the Carolinas are on schedule to produce more than 8 million metric tons of pellets this year. That’s twice the amount of biomass compared to 2016, and a 100 percent increase since 2009. Enviva, the world’s largest pellet producer based in Bethesda, Maryland, operates six pellet mills in the southeastern U.S. with one more under construction, where British utility Drax is expanding as well. Both companies derive timber harvest by-products for pellets from mature hardwood and pine timber stands, pine forests, as well local sawmill waste. 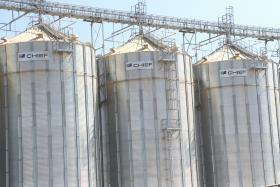 Highland Pellets, the newest mill constructed for $229 million dollars, started production late last winter. Chairman and co-founder Tom Reilley, who’s headquartered in Boston, picked south Arkansas because the region has an abundance of “semi-natural pine forests,” what locals call plantation pine. “As they grow, you thin them for interim cash flow and to let light reach the trees and nutrients to reach the ground, yielding a second thinning in 18 to 20 years,” Reilley says. 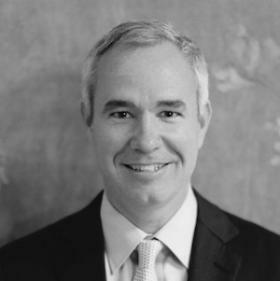 Reilley, a former wealth manager with Bear Stearns, recently ventured into biomass after founding Kalan Capital in 2007, a private equity fund that develops geothermal energy. Reilley declined discussing the cost of southern pellet production per metric ton, but he did say the current market price is around $137 per metric ton. He says he plans to build more pellet mills, another in south Arkansas, a few in Mississippi and possibly a mill in Maine — all of which, he says, boost local rural economies. Reilley is also investing in the Arkansas River port city of Pine Bluff (pop. 49,083) home to a majority African-American population and a historically black university. Right before the pellet mill opened, Reilley reportedly met with city leaders to launch Pine Bluff Rising, purchasing a derelict hotel in the city’s downtown railway district. He intends to generate a renovation boom to attract tourists and state conventioneers. Reilley is also attracting renewable energy entrepreneurs to the region who are touring Highland Pellets, recently awarded Groundbreaker of the Year Award by the U.S. Biomass industry. “We are not doing it differently,” he says. “We are doing it properly." Reilly says the moment his pellets are burned in the U.K., carbon emissions are immediately captured by new and maturing pine trees in Arkansas. The U.K. and European Union also classify woody biomass as carbon neutral. Arkansas Public Media queried state environmental groups to see if they agree with that equation. None could comment, saying they were unfamiliar with the new industry. 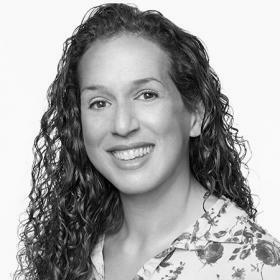 But Sasha Stashwick, an energy expert with Natural Resources Defense Council, based in New York, closely monitors the U.S. biomass energy sector. 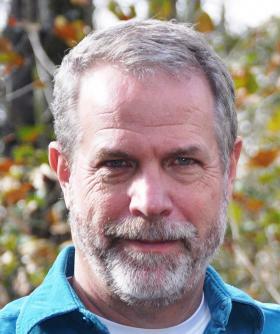 Stashwick says biomass-harvested forests, replanted with saplings or thinned to allow maturing commercial hardwood or softwood trees to grow, won't be enough to capture a growing surplus of new global biomass carbon emissions from converted coal-fired plants. U.S. industrial pellet mills must comply with state regulators which monitor facility air emissions and water discharges, but no federal or state policies on U.S. biomass production exist. To preempt public concern the industry established the international Sustainable Biomass Framework which certifies a mill’s biomass is sourced from legal and sustainable sources. The U.S. biomass industry also early on encouraged adoption of sustainable forestry standards, measures to protect water quality, biodiversity, wildlife habitat, at-risk species, and forests with exceptional conservation value. The Natural Resources Defense Council has zero tolerance for the burgeoning global biomass energy. In a recent coal-conversion study, NRDC predicts that by 2025 biomass will become a “stranded” asset, becoming too costly to operate compared even to new utility solar and wind installations. The Southern Environmental Law Center headquartered in Charlottesville, Virginia which is also monitoring the industry, holds a more moderate view, suggesting the U.S. biomass industry should be restricted from using whole trees from native forests or converting logged forests into energy “tree crops.” The center says America’s forests serve as critical carbon "sinks" absorbing 12 percent of all U.S. CO2 emissions. 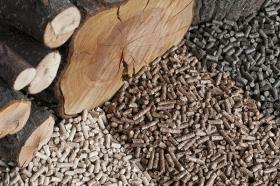 Wood pellet biomass is not yet part of the U.S. renewable energy portfolio. Instead many coal-fired electrical generating stations are switching to natural gas, which is currently cheap and plentiful, says Bob Abt, a professor of forest economics at North Carolina State University at Raleigh. “There’s a sensitivity by the American public to harvesting trees for fuel,” he says. Abt models the U.S. forest products supply chain for industry, academia and environmental groups. He says given the two extremes for biomass carbon accounting — that it’s either carbon neutral or worse than coal — he stands somewhere in between. “One of the key things is what would happen to the wood otherwise?” Abt asks. 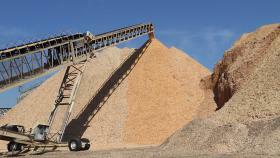 Top U.S. wood pellet producer Enviva sources wood waste, timber stand thinnings from both hardwood and softwood forests, and lumber sawlog tree tops and branches, which otherwise would end up on forest floors, the company says, emitting carbon as it decomposes. As for Highland Pellets, which purchases pine tree farm thinnings and lumber logging debris, Abt says it could claim a carbon sequestration advantage. Bioenergy analysts project the U.S. will produce 77-million tons of biomass per year by 2026, of that more than one third will be exported. But Abt believes, in the end, wood pellets will serve as a transitional fuel, with demand declining long-term as the global clean technology sector evolves. For now, the U.S. industrial pellet industry could foster even more tree farming on fallow land, which in turn could sequester even more atmospheric carbon. 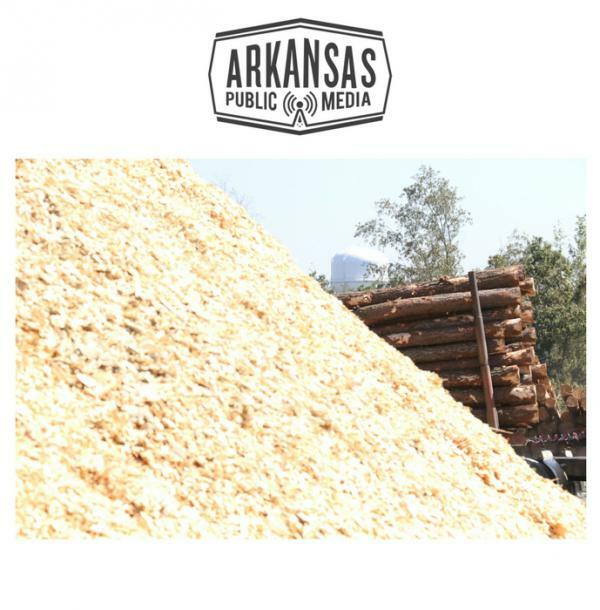 But with no federal or state biomass policies or laws to protect private forests, and given escalating demand near-term, any number of Arkansas wood baskets could get carried away. 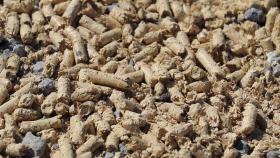 CORRECTION: The current U.S. market price for wood pellets is $137 per metric ton, which is not the price at which Highland Pellets sells its product to Drax. Also, 100 percent of Highland's pellets are produced from pine wood. An earlier version of this story also didn't clearly state the percentage of private versus public-owned U.S. forests.